It's day 3 of the Newton's Nook April release and today we are sharing a Fun Sentiment set called Simply Relative. This is one of those must have sets that are perfect when you need a sentiment for someone related. There are lots of sets for Mom and Dad but what about your brother, Aunt, Cousin etc. I mixed this set up with a bloom image from the new Lovely Blooms set. I used it to create a wood look. 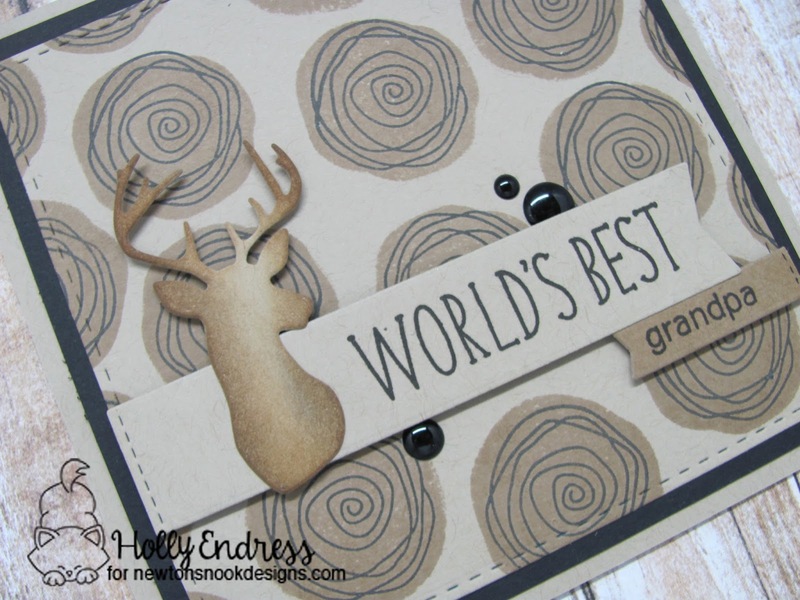 I stamped with the back of the stamp all over a piece of Kraft card stock creating a pattern. Then I flipped the stamp over and stamped the spiral image with Black ink over the dots. This is a great was to get more out of your stamps too. Then I die cut the panel and adhered it to a card base. I stamped the sentiment onto two banners and adhered them at opposite ends. I die cut a deer head from the Splendid Stags die set and added some color with Distress inks and adhered that over the banner. For an extra pop of Black I added some enamel dots. Great card--I really like the kraft! I especially like seeing cards for guys b/c I have a hard time coming up with ideas for them. Wow! The way you used to bloom to represent wood is so awesome! I love this masculine card and might have to CASE it for my Dad! Such a great idea! Holly your card is stunning! My grandpa would have loved it and I would have never guessed that you used the stamp from the Lovely Blooms set to do the logs. 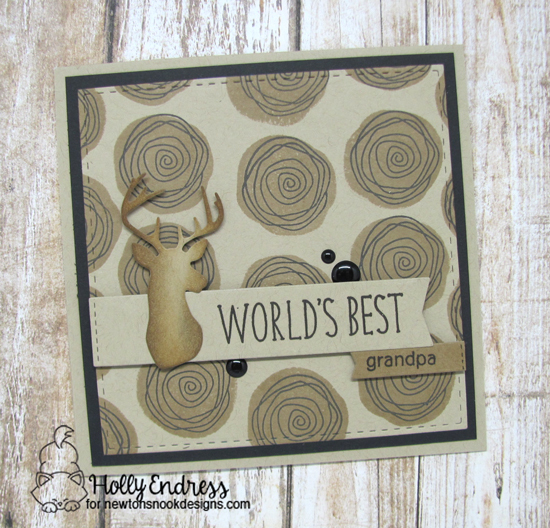 Fun guy card for gramps! Awesome idea! Masculine cards are always so hard to make and this one is a great example!!! love it! 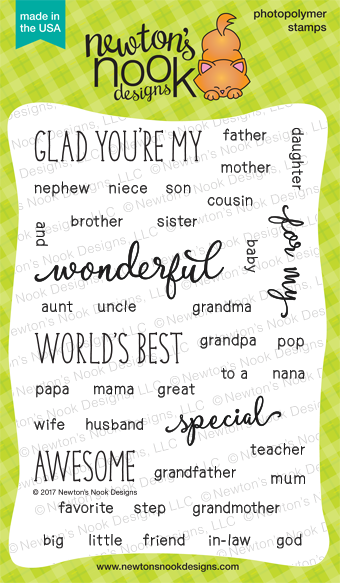 Very versatile sentiment set! Great card! I love this card! Love the woodland look! It's clever how you used the flower stamp to make it look like wood! Very clever how you made the wood pieces. this for my son's next birthday. This is such a great manly card! I love how you used the sentiment set. Great masculine card. This is such a perfect masculine card!! I live in a household of deer lovers. This card would be perfect for any of them. Great card. What a cool card!!! Love this! Love this masculine card! Very creative idea to make the wood look! I don't see many masculine cards. Thanks for choosing to do one. It's great. Fantastic card! Masculine cards can be so hard, but yours is wonderful! Love this and shows how you cab change it out to any name!! Nice masculine card, love the sayings in this set! What a cute masculine card. They are always the hardest to do. Thanks for the inspiration!